I have a cookbook, Desperation Dinners, that I pull out every once in a while when I need a meal in a hurry. Although some of the recipe titles are eye-rolling, to say the least, the meals come together FAST and are really, really good. Every time I use the book, I’m reminded I need to use it more! 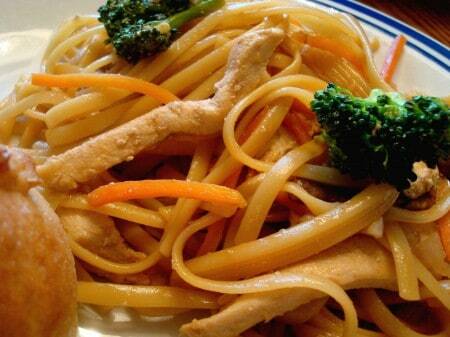 This meal, Lazy Lo Mein, is wonderful. I love Asian noodle dishes, and this did not disappoint. The ingredients are fresh and delicious and I am definitely adding this to my meal planning rotation. For the sauce, whisk all of the ingredients together in a 1-quart bowl. For the lo mein, cook the noodles according to package directions. Meanwhile, continue with the recipe, and when the noodles are done, drain and set aside. Make the stir-fry sauce and set aside. Heat the oil in an extra-deep 12-inch nonstick skillet over medium heat. Peel and coarsely chop the onion, adding it to the skillet as you chop. Stir from time to time. While the onion cooks, slice the chicken into strips about 1/4-inch wide. Add the chicken to the skillet. Raise the heat to medium-high and stir occasionally. While the chicken cooks, add the carrots, broccoli and mushrooms and stir to mix. Stir-fry the mixture until the chicken is no longer pink. Immediately add the stir-fry sauce and noodles. Raise the heat to high and cook until the noodles and chicken are heated through and coated with sauce, 2-3 minutes, stirring constantly. Serve, garnished with peanut halves (if using - I did not). Hi, Mel. I’m trying one of your new recipes every week this summer, and this one was a hit by all members of the family and I am happy to have a new one to add to our rotation. We like our Lo Mein saucy, so I think I am going to double the sauce next time….yum! I also added pea pods. I’d been avoiding oyster sauce, but the it was obvious what a wonderful flavor it brought in to the dish. It’s great to have a new stove-top option instead of turning on the oven on a hot day! Thank you! Katie – I definitely think if it is allergy related, I’d just leave it out. You’ll miss that little pop of flavor but honestly, I think the dish will still be delicious. We love this!!! But, I think my tree nut allergic son may have a sensitivity to sesame oil. He got a hive under his eye shortly after he started eating. He was mad when I took it away from him. I know there is so much flavor in that oil – is there a good substitute or would it completely alter the dish if I left it out? Thanks! Once again, Mel hits a home run. I didn’t have fresh garlic on hand (gasp! ), but I made do with some garlic powder. I can tell by the ginger that aromatics work wonders in this sauce, so I can’t wait to try it with the fresh garlic. I also had a surplus of rice noodles on hand and subbed that for lo mein noodles. Added bonus–no boiling involved! Regardless, this is easy and fantastic. Thanks for another great meal, Mel! I can always count on you for something quick, budget-friendly, and super delicious. I find that, first coating the chicken in cornstarch and browning it helps. It keep the chicken juices in. A trick I picked up watching a chef in China cooking in his kitchen. then I usually do as your steps say regarding the veggies, then throw chicken back in. …btw , your site is awesome…makes me hungry. I made this and it was super easy and super quick! The only sesame oil I could find was labeled hot, and let me tell you it was HOT!! I doubled the sauce recipe, but only added 1/2 teaspoon of the sesame oil and it still had a strong heat to it. But we really liked it. Something in the sauce smelled like “seafood sauce” that you eat at Japanese restaurants… do you have a good recipe for that? I’ve been trying to find one for months now. Anyway, we really liked this meal, thanks Mel for another awesome recipe! Thanks, Kensi! To be honest, I didn’t know there was such a thing as hot sesame oil. Yikes! I better be careful what I’m buying! I don’t have a good recipe for seafood sauce – at least one that is tried and true. Have you tried googling it? I’m sure you have. If I come across one that looks perfect, I’ll let you know! Julianne – hoisin sauce is more like a BBQ sauce whereas oyster sauce is definitely more “fishy” – either way, I’m glad you liked it! Made this tonight; excellent. I didn’t have oyster sauce, so I used about 1 tsp hoisin sauce. I have no idea if those two things taste anything alike, but, oh well! Still tasted good. Thanks for another winner. Anonymous – glad you liked this, thanks for checking in to let me know! I just made this last night. I left out the oyster sauce; it’s not kosher, but it was really yummy!!! DH loved it too! I made it tonight, it was very tasty. Yummy! Thanks Mel! 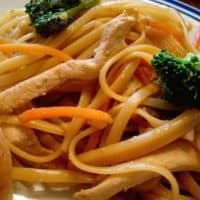 I love Chicken Lo Mein, and I’ve always been too intimidated to try to make it at home. This recipe looks totally do-able! Can’t wait to give it a try! That sounds pretty simple and yet tasty. Margaret – I’m so glad you liked this. It is a family favorite with us for sure. Thanks for letting me know! I’m rolling to my computer to write this review-stuffed with chicken lo mein. YUM. I did double the sauce for it (I like sauce!) and cut the chicken into bite sized peices (figured I’d have to do it then or as I put it on the kids plates. It was fast, easy and YUMMY. Can’t wait for lunch tomorrow! The kids each ate their plates. DH is out of town (which is why I picked tonight-he’s not a fan of Chinese food) So I’d say it would feed 4-6. Thanks for the great recipes! What a delicious desperation dinner! Looks great- I’m always looking for quick and easy for little league nights.